Hello wine lovers and happy wine Wednesday. As it sit in my dining room typing away to the falling snow, I can’t help but drift into my memory bank of my trip to southern France with David in 2009. The weather was sunny, warm and welcoming – a far cry from what I see outside the window this morning! Last night in French Wine Scholar, we tackled the wines of Southern France – namely Provence, Languedoc and Roussillon regions. The grape varieties from Provence are Italian influenced whereas the varieties of the Roussillon are Spanish. I visited both Provence and Languedoc regions in 2009 and drank a copious amount of rosé (funny story about Carcassonne and Max Smart). Provence is the birthplace of rosé as the Romans preferred this style to the dark, fully macerated reds of their local grapes. Rosé was for the nobility and the dark stuff was slotted for the plebeians. Fun. There is a huge Roman presence in Provence still as vast areas of ruins pepper the landscape. It is a mountainous region with approximately 316 days of sunshine a year. The white grapes are Rolle (Vermentino) and Ugni Blanc (Trebbiano) along with Rhône varieties like Bourboulenc, Clairette, Marsanne, Roussanne and Grenache Blanc. There are a few Bordeaux interlopers like Sauvignon Blanc and Sémillon as well as one AOC that permits Chardonnay. Can we say diversity? Black grapes almost exactly mirror the Southern Rhône region with Grenache Noir, Syrah, Mourvèdre, Carignan and Cinsault along with a few Italians Broquet (Bracchetto) and the Bordeaux Cabernet Sauvignon. The dominant wine here in Provence is by far rosé which makes up 89% of all production. The Côtes de Provence AOC is made up of 5 non-contiguous vineyard parcels (physically, they do not join each other). Like Bordeaux, they have one Cru Classé which ranked 18 estates in 1955. Provence is another standout for biodynamic and organic viticulture along with Alsace. The dry, sunny conditions make this possible. Due to the overtly tannic levels in the Mourvèdre grape, a few AOC’s mandate aging prior to release such as the Bandol AOC, which is arguably the most famous of the Provence AOC’s. 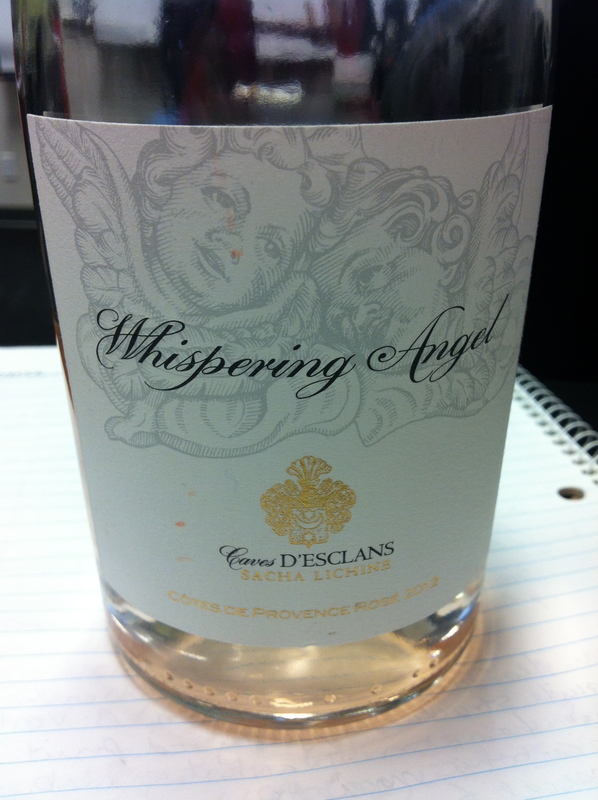 Caves D’Esclans 2012 Whispering Angel Côtes de Provence Rosé AOC (13.5%) $28.99 This may just be the prettiest bottle of rosé I have ever seen and certainly is beautiful in the glass. This is a predominately Grenache driven blend with just the slightest hint of soft pink colour. Flavours of citrus and strawberry with healthy minerality and watermelon. Pure heaven. Domaine Bunan ‘Château La Rouvière’ Bandol AOC 2004 (14%) $59.99 This bottle of mostly Mourvèdre was corked. I did smell it and taste it regardless and with already 10 years of aging, it was just starting to be OK to drink with huge grippy tannins. I will do a full tasting note when I get a good taste. We didn’t waste anytime and went straight into the Languedoc and Roussillon regions. It is said that southern France was the first place hit with the Phylloxera epidemic and it decimated vineyards here. The Languedoc is the birthplace of winemaking cooperatives and the first one was built in 1905. Coops still figure predominantly in this region which has three unique growing regions: Atlantic Corridor, Hillsides and Mountains and the Coastal Plains. The best wines from the Languedoc region are made in the Hillside and Mountain areas. White grapes from this region include the Piquepoul Blanc grape which is knows as the ‘lip stinger’ for its high acidity and grapefruit flavours and Maccabeu from Spain that has apple and almond aromas. Carignan is the biggest red producer and is usually blended with Grenache, Syrah and Mourvèdre. The majority of the AOC’s found in the Languedoc have been recently made into AOC’s however the AOC of Limoux is famous for being the oldest sparkling wine region in the world. Monks here were making sparkling wine some 150 years prior to Mr. Dom Pérignon ‘seeing the stars’. Blanquette De Limoux AOC made from 100% Mauzac has been a recognized appellation since 1938. Antech ‘Expression’ Brut Crémant de Limoux AOC (12%) $29.99 A bit simple for my taste, lots of apple and Chardonnay notes. It was soft and round. I have many other wines I would spend $30 on before I thought of buying this. 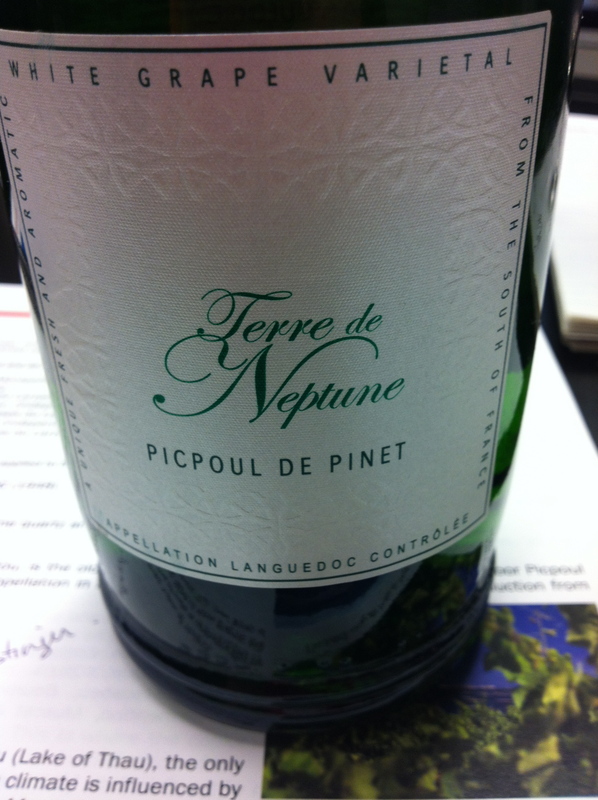 Terre de Neptune 2012 Picpoul de Pinet Languedoc AOC (12.5%) $17.99 As the first was soft and round, this was sharp and crisp and a GGG ‘Hell YES’. Wicked acidity and citrus, salty and mineral notes. Just awesome – I guess I like a good lip stinger! More please! Château La Gravette Minervois Blanc 2011 (12.5%) AOC Minervois $18.99 Loved this one too. High acid and refreshing, this glass of vino called out for a white fish meal or a bowl of almonds. It was a bit bitter and I liked it. A mostly Maccabeu blend. Domaine de Nizas 2008 Languedoc AOP (14%) $28.99 A super smooth GSM blend (Grenache, Syrah, Mourvèdre) that was medium in body with black fruit and tree bark notes. Delicious. Finally, we dove into the Roussillon region of France which has strong ties to Spain. This is a very windy region with seven types of wind that blow all through the year. It is said to be a very ‘up and coming’ wine region of the world as land prices are reasonable (for France) and new producers are doing interesting things here. It gets 325 days of sunshine a year, so if you like the grey and rain, this is not a place for you! It takes its name from the red iron rich clay and sand (Rousse is old-French for red). The rivers have a significant cooling effect here as the water in the rivers is snow and ice melt from the Pyrenees. The grape varieties are the same as the Languedoc with the exception of Muscat d’Alexandrie and Tourbat. Roussillon is quite well knows for its VDN (sweet fortified wines) and need a minimum of 15% alcohol. 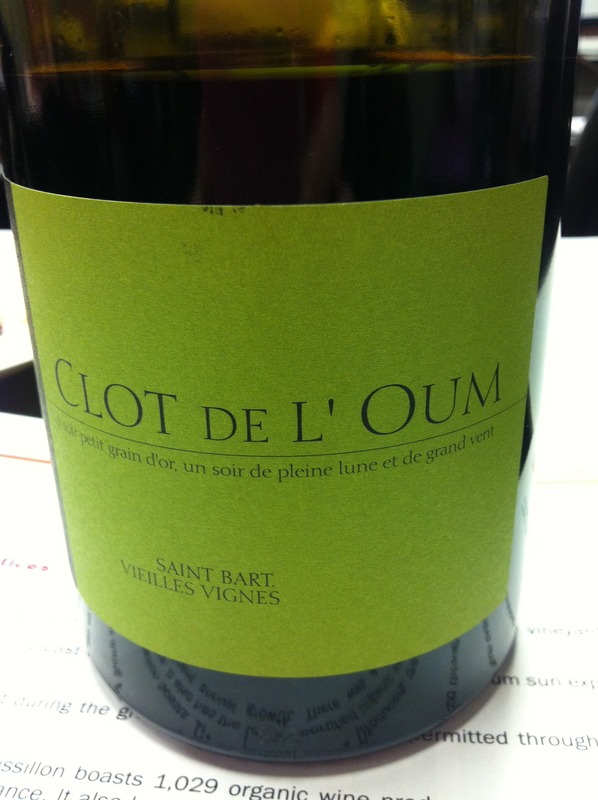 Clot de L’Oum ‘Saint Bart Vieilles Vignes’ 2004 Côtes du Roussillon-Villages Caramany AOC (14%) $39.99 This is a delicious wine made from 100-year-old Carignan vines and Grenache and Syrah. This biodynamic produced wine is big and meaty and tannic with notes of black currant, concentrated raspberry fruit,liquorice and spice. I called it a “Dad” wine that you could see being paired with a huge steak. GGG ‘Hell Yes’ found at Kits Wine Store. Whew – we are really burning through the wines in this class! I love it! Learning SO MUCH, I can only hope my brain is able to retain all of this information for the exam on March 18th. We get a week off next week from class to take part in the Vancouver International Wine Festival. I am attending Rhône Perfection on the Thursday night and then the big tasting room with my girlfriend Sylvia Talbot. The focus this year is on France (bonjour!) and bubbles (bonjour!)! I have a feeling it will be a fantastic night. There are so many roses it can get confusing. Whispering Angel is a good example. They spend a lot of money on promotion. at a suggested retail price of $100US. used are Grenache Noir and Cinsault although not 100%. The best rose I found in 2014 was from langue d’oc. old language of this area. like a lot of things in life can lose it freshness too quickly.